New Password host Regis Philbin and the old one, Allen Ludden. CBS will prime the cash pump on Million Dollar Password, a "modernized version" of the old chestnut. 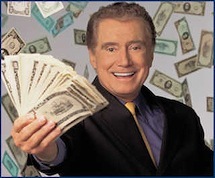 Hosting, of course, is Regis Philbin. Or as CBS prefers to call him, "the ever enthusiastic and beloved Regis Philbin." The network has ordered six prime-time episodes for midseason. 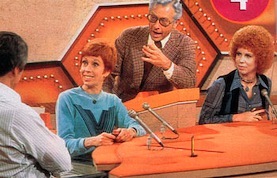 Original host Allen Ludden, whose wife was Betty White, died in 1981. ***A pair of still obscure cable networks, little known G4 and lesser known MOJO, have landed the rerun rights to NBC's hottest series, Heroes. And neither will be taking long to activate their new acquisition. G4 will have an all-day marathon of first season Heroes episodes on Oct. 27-28. Then comes a "mini-marathon" of this season's first six episodes on Nov. 3. After that, G4 will have weekly Saturday night reprises of each week's current Heroes episode. MOJO, which airs all of its programming in high-definition, begins its Heroes marriage on Nov. 1 with the first six episodes of the ongoing Season 2. The network then will air the current week's episode on both Wednesdays and Thursdays. The way this is going, unclebarky.com soon will realize its longtime dream of repurposing episodes of Camp Runamuck, the fabled 1965 NBC comedy series starring Dave Ketchum as Senior Counselor Spiffy and Alice Nunn as Mahala May Gruenecker. What a traffic-spiker that's gonna be.